Today we celebrated the official presentation in press conference of the arrival of Wine Run in Rioja Alavesa, a brand that was born in Lanzarote to support and promote La Geria, its wine area and one of the most striking landscapes of wine. Cuadrilla de Rioja Alavesa, with the participation of Eusko Jaurlaritza (Basque Government), has reached an agreement with Cabildo de Lanzarote to boost the brand Wine Run creating the event “Rioja Alavesa Wine Run”. A sporting event that seeks to vindicate differentiated wine regions with a landscape and heritage cultural interest, as well as tradition and commitment to quality. The event will be held in Rioja Alavesa on October 30th and will provide distances of 36, 20 and 10 kilometers in a journey through paths and trails through vineyards. A sports offer which aims to cover the gap between urban and mountain trials, offering an alternative to popular athletes who want to try this discipline. In addition, you can participate in a 10 km popular march, walking through vineyards and wineries as a way to know the values of Rioja Alavesa. Since its beginning, the event has the support of ABRA (Rioja Alavesa Winery Association) and Ruta del Vino de Rioja Alavesa (Rioja Alavesa Wine Route). 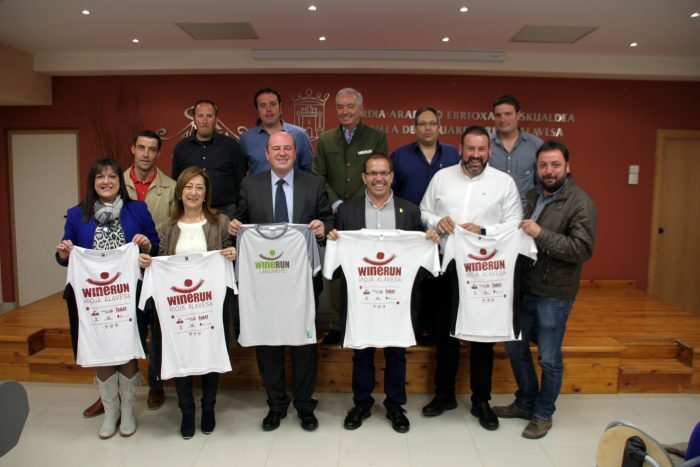 The intention is to involve wineries and wine tourism establishments for participants in the Wine Run to enjoy a wine experience in the complete region. The trial will go through some of the wineries in Rioja Alavesa, its vineyards and even their barrel rooms. By enrolling, participants can enjoy special deals in wine and wine tourism, in order to complete the experience of their stay in Rioja Alavesa. – Deputy for Economic Development and Territorial Balancing of Diputación Foral de Álava, Pilar García de Salazar.